At first, last January, when I could no longer get free English-language news programs on TV at home – programs such as CNN, the BBC, NBC Nightly News (I love the sound of Lester Holt’s voice), or Sunday evening’s “60 Minutes” – I went into a kind of withdrawal. Don’t ask me why the cable company here in San Miguel de Allende changed its ways, or, rather, changed its contract with my apartment complex. Nobody seemed to know (or would tell me). All I knew was that I could no longer stay on top of the “BREAKING NEWS,” as CNN, for one, had allowed me to. Not that I’d sat in front of the TV set all day. Hardly. It’s just that when that or any other news channel was on when I was home — as I cooked, sewed, washed dishes, folded laundry, or whatever — I could feel fairly attuned to national and world affairs. I’d become, without realizing it, a news junkie. Not anymore. I’m over that particular addiction now. (Now I just read the news online every morning.) Having only Spanish-language TV programs at my disposal has become a blessing in disguise, I’ve found to my surprise. 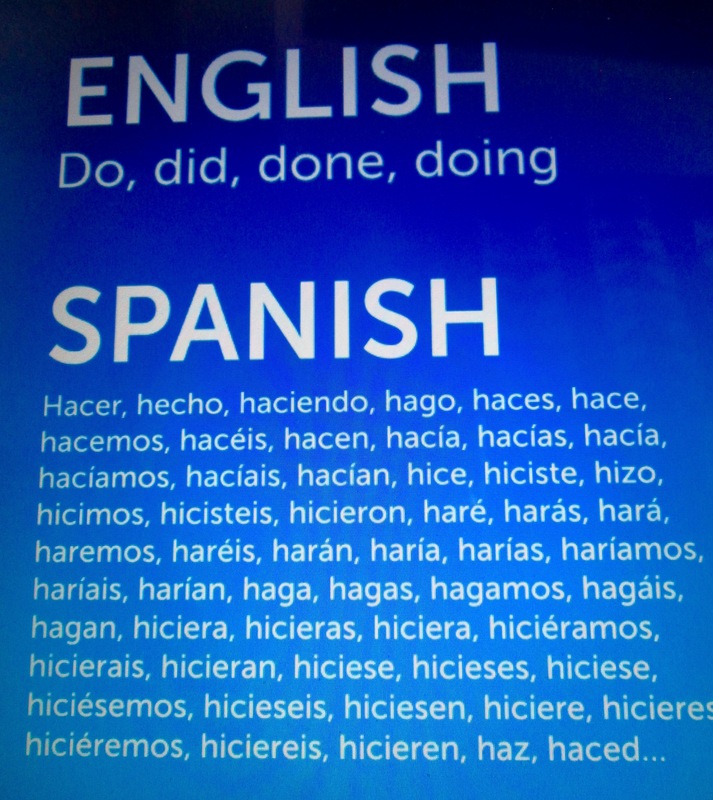 It’s helped me improve my Spanish acquisition skills. Or at least that’s what I like to think. “Law & Order” dubbed in Spanish is my favorite program. I try to pay attention as each dramatic episode — “ripped from the headlines!” – which is set in my old hometown, NYC, unfolds. As the many brave and bold characters speak, I find I grasp most of the Spanish pronouns, prepositions, conjunctions, articles and interjections. I catch some of the nouns, adjectives, and adverbs. But I’m able to untangle few (if any) of the verbs. Consequently, I’m not getting what anyone is saying. This gets discouraging. And I know I’m not the only one who feels this way. One friend my age here admitted to me that she broke down in tears in her Spanish class recently. Another friend, relatively new to San Miguel, has been shopping around – as if trying on clothes – to find the right tutor, class, Spanish-conversation group (or all of the above) to meet her personal needs. This may take a while. Another friend, who’s lived here more than ten years, has given up. “Too hard for me at this stage,” she says. She’s got a point. Learning a brand-new language in one’s seventies (as the brain is slowly shrinking with age) has to be the mental equivalent of an Everest climb for most of us. But I, in my stubborn Taurusness, refuse to give up. I carry flash cards with me on my walks in the park. I eavesdrop on Mexican people’s conversations in the street. I do a page or two from a Spanish workbook over lunch most days. I channel-surf Spanish-language TV programs and tune in and out. 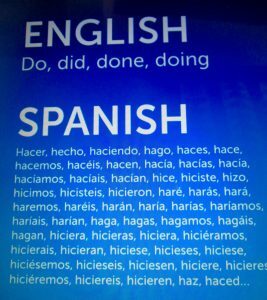 And I continue taking private Spanish lessons with my ever-patient and thoroughly good-natured maestra (teacher), Edith, once a week. Over the nearly three years she has been my tutor, Edith and I seem to have scrapped the idea of formal lesson plans — including verb tenses and such, which tended to make me super-disheartened and grumpy (“I used to be an A student and now I’m a failure!” I would whine to her in broken Spanish) – in favor of lively conversations and a lot of laughter. She tells me (en español) her news and stories about her life. I stare into her brown eyes, listening and nodding. Then she painstakingly reviews and writes down every aspect of her story that I hadn’t grasped, before asking me to tell her my news (en español), stopping to correct me as I stumble along. At this rate, of course, I’ll never be fluent. But who cares? San Miguel de Allende isn’t called “Mexico lite” for no reason. Just about everyone here speaks English – the taxi drivers, the waiters, the kids who work at the sprawling, modern mall – and they want to practice on those of us who are clearly Norte Americanos. Getting back to CNN and all those other news programs: I don’t really miss them. I’m glad I don’t have to hear even parts of speeches coming out of the mouth of You-Know-Who in the WH. I can’t bear the sound of his voice. He’s now history to me. I have other Everests to climb — like recognizing ALL the parts of speech when I hear them in Spanish.